Transparency is the new "it" factor in our information world. Use it effectively with your management team. Transparency is the new “it” factor in a world where information is available at the click of a button. A CEO looking to move his or her company forward would do well to embrace this trend. Indeed, management training thrives when CEOs exercise transparency and open communication. In Grovo’s Good Manager, Bad Manager white paper, 87 percent of managers surveyed said they wished they'd had more training before they took on their roles. A possible reason: A manager’s uncertainty and lack of training can cause major issues at a company's lower levels. Gallup’s State of the American Manager report in 2015 found that 50 percent of the 7,272 professionals surveyed said they had quit a job to “get away from their boss” at some point in their career. This means a lot of managers are failing to motivate their staff or make them feel comfortable. Zappos's CEO Tony Hsieh is a good role model; Hsieh makes the most out of transparency at his company. In fact, his company’s Family Core Values include “build open and honest relationships with communication.” Zappos is known for giving employees a chance to be heard at all levels. The company is also heralded for having thoughtful public interactions between employees and management. Back in 2008, the company had to lay off nearly 8 percent of its staff. To help its employees through that event, Zappos started a feed on Twitter to allow each employee to react and share his or her thoughts publicly. This way, employees were heard by CEOs, management, the media, the Twitter community and other interested parties. "We believe that transparency is important and have continued to encourage our employees to Twitter," Hsieh said at the time. "We also publicized on our blog the email sent to employees within minutes of it's being sent internally." Now, more than ever before, CEOs can be as open as they choose to be with their employees. These leaders also need to communicate their desired level of transparency with their managers. They need to focus on training managers to themselves become true leaders in the office. The question is, how do they do that? Managers are more successful when they have a holistic view of their management style in the workplace; this is why CEOs should be assigning self-appraisals on a regular basis. As part of that task, managers must talk about their successes and what they’ve learned from them. They need to explain challenges that stuck out to them. You should encourage managers to provide honest answers, accompanied by concrete examples of how they overcame those problems. Self-appraisals aren’t just a simple exercise in good communication; they’re a vital component within the performance review process. Tip: Assign self-appraisals as an ongoing activity. When managers understand that they must provide a self-appraisal at the end of each month, they are training in becoming more self-aware and deliberate in their management tactics. Managers need to first see transparency before they can talk about themselves. Self-appraisals can then be used in a performance review, to help managers engage in one-on-one discussions about their management success. Before suggesting how any manager can improve, the CEO should share a personal self-appraisal to demonstrate how this document will be used. Ask managers for input about how they could improve their performance. Create action plans to help managers set goals to become better leaders. Open communication is crucial to workplace transparency. Outlining clear expectations and offering constructive feedback is essential for keeping managers more engaged. More manager engagement will also lead to better personal accountability. Tip: Schedule time to meet with managers regularly so they can review practices that worked and ones that didn’t. These meetings will engage managers and encourage them to hold themselves accountable to their personal goals. 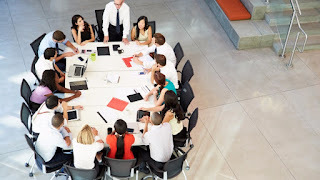 During these meetings, it's okay to offer advice for any recurring issues, but don’t micromanage -- allow managers to solve problems in their own way, and recognize them for creativity and innovative decision-making. Let these meetings serve as a place where managers can learn from their fellow managers. Education and empowerment are important for managers. Companies are always on the lookout for workplace leaders. But how many of those companies have a strong program in place to empower future leaders? A 2015 Global Human Capital Trends report from Deloitte found that 53 percent of younger workers surveyed said they would love to take on leadership roles. Unfortunately, only 6 percent of organizations have such leadership programs. Management training should be an ongoing strategy, not a start-and-finish program. The installation of good continual leadership programs will help create a pipeline of young talent who can be transformed into good leaders. Tip: Find events and other educational resources that fit each manager’s professional goals, and pay for their attendance or subscription. Pair your top-performing employees who want to learn leadership with managers who themselves are pursuing continual education. This way, both have a learning buddy. Also, encourage managers to share new learning opportunities they find and want to pursue. CEOs should be approachable and act as a support for autonomous managers. Consider attending these events alongside your managers. That will show your willingness to continually learn and grow with your company. Overall, transparency plays an imperative role in management-leadership training. It makes performance reviews more productive, gives young talent opportunities to become leaders and allows managers the chance to become more educated in their roles. These transparency tips can also assist with relationship-building between CEOs and management. Being active and present in management training enables managers to receive inspiration from executives, instead of flying under the radar. This kind of working relationship improves managerial performance and encourages a similar expectation between management and employees. Transparency from the top down improves overall productivity and performance throughout the entire organization.